Get closer to the real thoughts and feelings of your respondents while also helping reduce the need for extensive, costly and time consuming travel. Audio capture can contain a great deal of sentiment information in your respondent’s feedback – from their tone of voice to the way they phrase their concerns and excitement. Photo capture lets your respondents show you details, memories, emotions, and meanings. Their captured photos can “speak” for respondents when words cannot be found. Gather ‘naturally occurring’ video data from your respondents. Let respondents take you through their activity detailing their environment, gaze, expression, body posture, gestures, and more! Collect open-ended text information from your respondents. Text responses are a great way to let respondents submit additional commentary to their uploaded photos and videos. You decide what information you want to collect from your respondents and in what format. You can choose to make your activities one-time or recurring. Respondents will receive an email invite containing research details, app download instructions, and their credentials. Upon log in, respondents will see all activities available to them. Civicom ThoughtLight™ can be accessed in locations where there is no data connectivity. Offline accessibility lets you gather insights from locations where most researcher platforms are not able to reach. Capture your respondents’ GEO location at the time the activity take place. A perfect way to know if they were really there! Use ThoughtLight as part of a bigger research study by pairing it with Chatterbox®, our Online Research Community platform and CyberFacility®, our IDIs and Focus Group solution. We manage the respondents and the incoming data for you. We can work with your panelists and respondents or we can recruit for you. 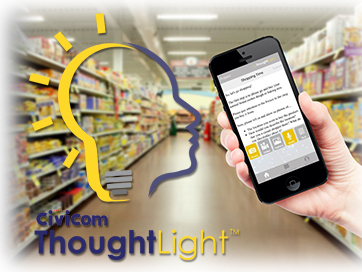 Civicom ThoughtLight™ Mobile Qualitative helped a large manufacturing company understand how packaging influences consumers to purchase coffee at their local grocery store. ThoughtLight™ helped dermatologists at a healthcare center become more proficient at diagnosing and managing the vast array of eczema problems they faced in daily practice. Civicom helped a full-service gas station company better understand whether their gas stations were compliant with service protocol, employee uniform code and quality of service.